NAPA, CALIFORNIA, DECEMBER 22, 2016 - Folio Fine Wine Partners is proud to announce Ribera del Duero pioneer Alejandro Fernández and Grupo Pesquera join the national importer, effective January 1, 2017. 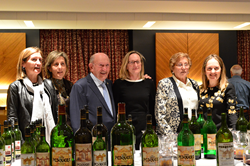 Grupo Pesquera’s portfolio includes the properties of Tinto Pesquera and Condado de Haza (D.O. Ribera del Duero), El Vínculo (D.O. La Mancha) and Dehesa la Granja (Vino de la Tierra de Castilla y León). The agreement expands Folio’s presence in the Spanish category and positions the business for continued growth in its second decade of business. Considered by many to be a living icon of modern Spanish wine, Alejandro Fernández established Bodegas Tinto Pesquera in Ribera del Duero in 1972, and has been hugely influential in the resurgence of this important wine-producing region. The critical acclaim received from the outstanding quality of the wines was instrumental in Ribera del Duero receiving DO status in 1984, and its ongoing recognition as a producer of quality wine, much due to the tireless work of Alejandro Fernández and his focus on excellence. The four estates comprise exclusively Tempranillo with the exception being El Vínculo in Campo de Criptana (D.O. La Mancha), that also produces Alejairén, the only La Mancha white wine aged in oak. Today the estates are run and managed by Alejandro’s four daughters and second generation – Lucía, Olga, Maria Cruz, and Eva. With 11 wines in the portfolio, the wines range in retail price from $19 for Dehesa La Granja and El Vínculo, up to $145 for the limited edition Tinto Pesquera “Millenium,” the latter produced at Alejandro’s original winery. Wines are available nationally through fine wine retailers across the US.